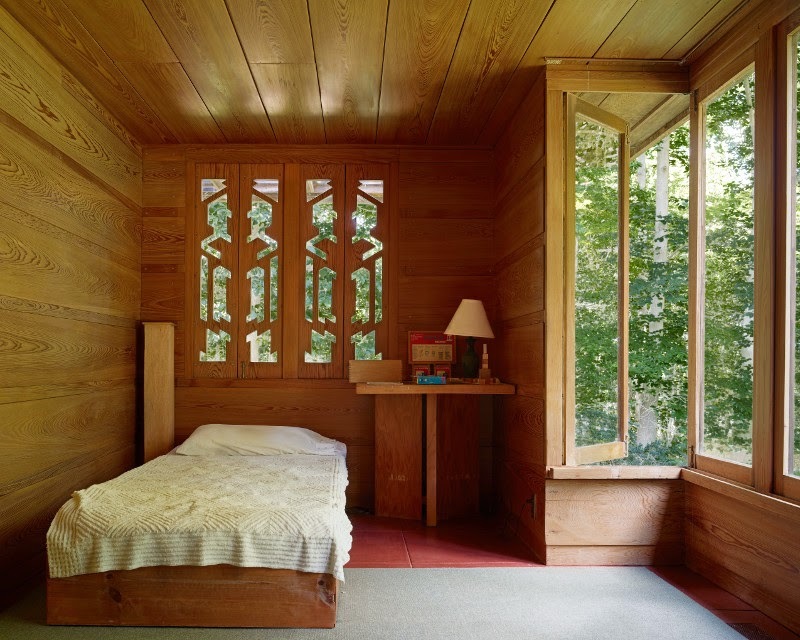 Frank Lloyd Wright's Usonian Masterpiece ~ The History Girl! I often travel to historic sites that were built in the eighteenth and nineteenth centuries. Once in a while, I will come across one from the early twentieth century that is intriguing. However, a structure dating from 1941? While I am not usually one for this time period's architecture, I absolutely fell in love with the Pope-Leighey House in Alexandria, Virginia! The Pope-Leighey House in Alexandria, Virginia. The Pope-Leighey House was originally known as the Pope House when it was completed in 1941. Loren B. Pope and his wife Charlotte wrote a three page letter in 1939 to acclaimed architect Frank Lloyd Wright asking him to design a home for them. Loren, a journalist for the Washington Evening Star, was intrigued by Wright's designs and hoped that he would oblige to his desire for a suburban home for a small family with a budget of $5,000. Pope owned a one-and-a-third acre lot at 1005 Locust Street, a dead end road, in Falls Church, Virginia. Frank Lloyd Wright designed the home using the Usonian house idea that he developed in the late 1930s: the concept being that the house is modest in size so as to be affordable for American families, efficient in design, and well-sited for the surrounding environment. Wright relied on three major materials to accomplish this goal: brick, cypress wood, and concrete. All three elements are visible on the interior and exterior of the Pope-Leighey House. Overall, the house is L-shaped, one level in height, flat roofed, and features an open floor plan. Initial plans called for the house to be 1,800 square feet but financial constraints further reduced the size to 1,200 square feet. Interior of the Pope-Leighey House. Photo courtesy Brian Thomson/The Ethan James Foundation. There is a strong use of horizontals throughout the interior and exterior of the house; part of Wright’s ideals of connection to the land. The house was built on a concrete slab with radiant-floor heat, eliminating the need for external heating systems, ducts, and vents. All of the cypress wood siding is laid horizontally on the interior and exterior walls. Exposed red brick is visible on the fireplace, the utility areas, the three piers, and the planting areas surrounding the house. The flat roof is built-up, topped with gravel. The house was designed without a garage; rather it has a large cantilevered carport, another cost-saving measure. Once inside the main entrance, accessible from the carport, five descending steps transport the visitor into a spacious living room with eleven-foot ceilings. Large glass windows open into a screened-in porch on the right side or a patio space on the left. A narrow hallway, not much wider than the average-sized man, leads to two bedrooms and one bathroom. For light, ventilation, and decoration, the house has a patterned ribbon of clerestory windows between the top of the wall and the ceiling in the living room and the hallway. These windows open up toward the outside in an awning style. The unique design on each window is of no particular pattern. Some speculate that it is a turtle but there is no definitive explanation behind Wright's unique design. 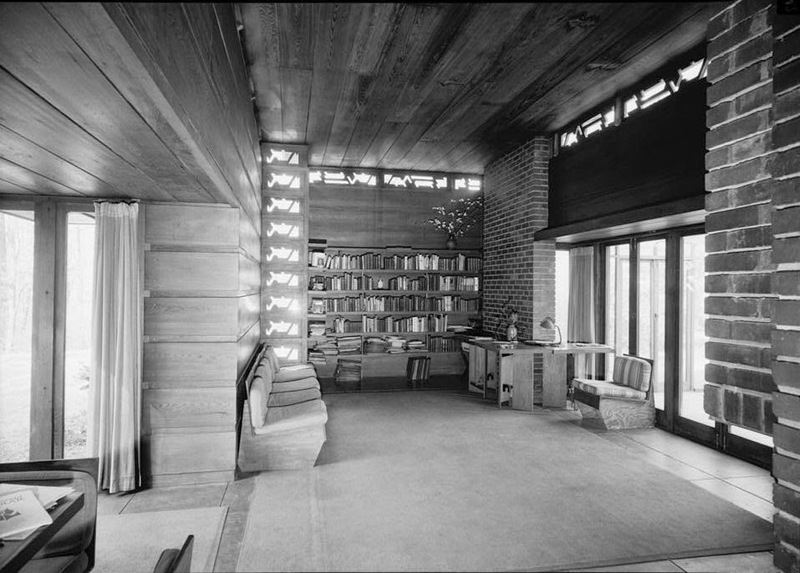 As with all of Wright's projects, he designed and supplied all of the furnishings for the house. Most of the furniture (shelves, bureaus, and closets) is built-in and all the furniture, including the kitchen cabinets, tables, and chairs, are constructed of plywood. All of the tables are the same height, so when pushed together, can form a small or large dining table, depending upon the occasion. Likewise, the chairs can be separated or put side-by-side to form a couch. The construction of the house was overseen by Wright's apprentice Gordon Chadwick and Howard Rickert from Vienna, Virginia served as master carpenter. Wright visited the house several times during its construction to check on the progress. Wright was very pleased with the house once it was completed. According to Loren Pope in a 2008 interview, he said that Wright, "felt it was one of his best Usonian houses and actually wanted to name the house 'Touchstone.'" After living there only six years, the Popes sold the home to Robert and Marjorie Leighey. In 1961, the State of Virginia informed the Leigheys the house would be condemned to make way for Interstate 66. Robert died in 1963. Marjorie refused the Virginia Highway Department's initial offer of $25,605 and agreed to a negotiated amount of $31,500 in 1964. In July of that same year, Marjorie donated the home to the National Trust for Historic Preservation. In the autumn of 1964, the home was dismantled, moved, and reconstructed approximately twenty miles away on the property of the 1805 Woodlawn Plantation in Alexandria, Virginia. It opened to the public as the Pope-Leighey House in 1965. Marjorie Leighey was given life-rights to the house and continued to reside there from 1969 until her death in 1983. In 1995, the home was moved a second time. Due to poor soil conditions along the ridge where the house was originally relocated to, it was moved approximately thirty feet away. Today, this diminutive but cozy home remains a hidden jewel among the trees on the outskirts of the 1805 Woodlawn Plantation, where one can travel over 100 years within a matter of minutes.